Buying O-scale containers or other commercial options are a bit cost-prohibitive as well as would need a bunch of work to get them weathered. Another option would be to scratch build the containers using conventional means with card and styrene, but that was quickly discounted given the extreme effort required as well as likely having to sacrifice some level of detail. Although there is certainly a bit of upfront cost, I went the route of 3D printing my own. I'll go into more detail about the Phrozen Make resin-based printer I bought last year in another post, but suffice it to say that it is an excellent device which I used to print the containers you can see here. The Make has been replaced by a newer version called the Phrozen Shuffle, but the quality is about the same from what I've heard. 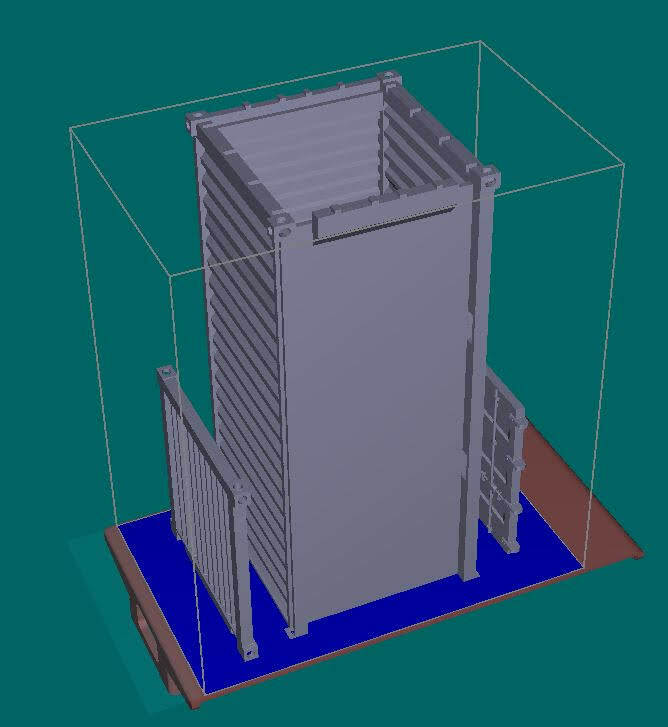 To do a quick proof-of-concept, I went out and found an existing 3D model of a container which contained a sufficiently high enough level of detail. Here is a link to the original model I found over at Thingaverse: Original 3d Model. I'll skip posting all the other pieces - check it out on Thingaverse if you're interested. I printed out the pieces separately with the intention to simply glue them together at the end. After messing up the scale a few times, I finally got the pieces to all print out. Unfortunately, large flat objects printed with resin (at least the resin I used) tend to warp a bit during the curing process. I took the model into ZBrush and proceeded to join the main body pieces into one model. 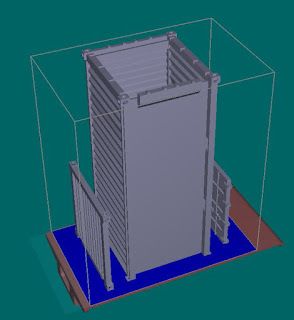 As you can see in the screenshot, the main body is printed vertically with the end and doors printed separately next to it. One problem with the model that I spent a lot of time fixing is that the insides of the pieces are all flat. By flat I mean the corrugation pattern is not carried through to the inside and instead is just filled with material. Expensive resin in this case... Corrugating the insides cut the amount of resin required by half. The model had other issues as the door was a bit low-resolution as it was intended to be printed on an FDM printer. I ended up rebuilding the entire door from scratch within ZBrush. The yellow container pictured above was my prototype. The steps below are what I ended up with after some experimentation described below. Here is a photo of a printed body section. It has been cleaned with isopropyl alcohol via airbrush. The resin I use is a bit sensitive to submersion in alcohol and tends to split apart if left in a bowl of it for too long. I've found that 'power washing' it with the airbrush is the way to go. The end still warped a little bit during curing, but it was easily persuaded to fit together together with the help of Gorilla Glue and some clamps. The following steps document the painting process I used. After the back is glued on to the body, I primed in a flat gray spray-can automotive primer. Next, the second step is base-coating in Burnt Sienna. Next, areas of Orange Iron Oxide pigment mixed with Burnt Sienna paint were painted on with a sponge brush. I can't say enough how pleased I am with Earth Pigments. Very reasonable prices on a great set of products and non-toxic to boot! I guess wearing a mask is still not a bad idea given any small particulate is not great to breath in. Anyway, I highly recommend them. The pigments give some texture to the rust areas. Here are the primary Earth Pigments I use for adding a rust weathering effect. Natural Umber, Orange Iron Oxide, Burnt Sienna. I'm utilizing the 'hairspray' method as I've described in previous blog posts to weather these containers. After the rust layer has dried, a clear gloss coat needs to be applied. This is applied via standard rattle-can and allowed to fully dry before proceeding to the next step. It is important that the clear gloss coat is oil-based to prevent later steps from damaging the rust effects. The next non-pictured step of liberally spraying the containers with my favorite '80s hairspray: Aqua-Net. I have the 'regular' and not the 'all weather' version. I've not tried the all-weather so it may work, but if they made it waterproof in any way, it could cause problems. Fortunately I stocked up when it was on sale at Walgreens. Next, after the hairspray has dried, I airbrush 'primer gray'. It really isn't primer - it is water-based and just called that because real things are often primed with this color of paint. It is important to airbrush rather than brush this on as the technique won't work if the hairspray gets too wet from the paint being applied over it. Once the gray overcoat is dried, it is time to get it wet again. I spray the whole container with water and let it set for a couple minutes. The water will soak through the gray paint and dissolve the underlying hairspray. Using a combination of cotton swabs, stiff brushes, dental picks, and scraps of balsa wood to scratch off the gray paint to reveal the rust painting underneath, the desired level of weathering can be achieved in a nice naturally chipped fashion. I added some additional weathering using the same paints and pigments as above. In addition, adding a dusting of Natural Umber gives things a 'dusty' look. After the weathering is complete, it is time for decals. This was my first real experience with applying decals (other than with a model airplane or two decades ago). For this, I used a Inkscape to create the graphics and printed them on decal paper made for my laser printer. I carefully cut them out from the paper and used MircoSet and MicroSol setting solutions to affix them to the containers. Here are a couple photos after the decals have been applied, but not yet weathered. I learned a lot about what all of the numbers & letters on the containers mean and utilized the algorithm to produce 'proper' numbers that the check-digit works for. Each container I made has a unique serial number to track it. Finally, here is a fully weathered version of the container - including weathering of the decals. There is still quite a ways to go before seeing 100s of containers out on the game board, but this was a fun and interesting project which resulted in a neat detail to add to my existing games. So far I've completed six containers and they worked great. If there are any questions on techniques or tools used, please drop me a message. I'm always happy to share & discuss!